, an English divine, celebrated for his uncommon skill in the mathematics, was born at Eton, in Buckinghamshire, about 1573, or, according to Aubrey, March 5, 1574. His father was a scrivener there, and taught his son writing and arithmetic. He was afterwards bred a scholar upon the foundation of that school, and was elected thence, in 1592, to King’s college, in Cambridge; of which, after the regular time of probation, he was admitted perpetual fellow. 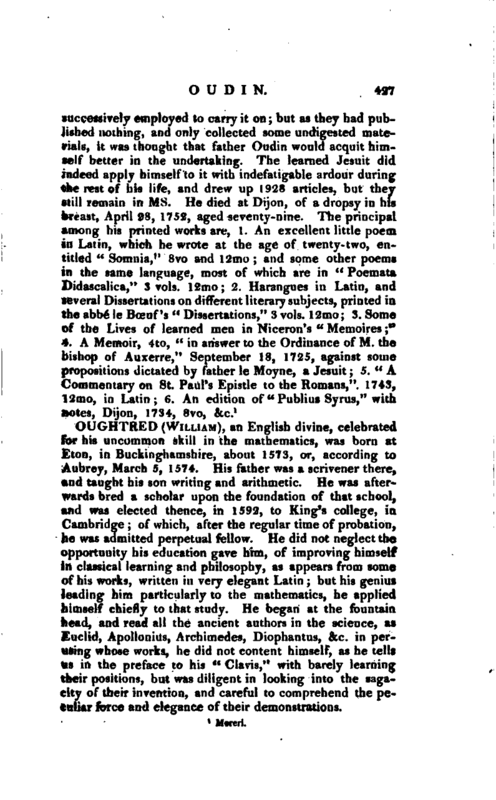 He did not neglect the opportunity his education gave him, of improving himself in classical learning and philosophy, as appears from some of his works, written in very elegant Latin; but his genius leading him particularly to the mathematics, he applied himself chiefly to that study. He began at the fountain head, and read all the ancient authors in the science, as Euclid, Apollonius, Archimedes, Diophantus, &c. in perusing whose works, he did not content himself, as he tells us in the preface to his “Clavis,” with barely learning their positions, but was diligent in looking into the sagacity of their invention, and careful to comprehend the peculiar force and elegance of their demonstrations. | After he had been at Cambridge about three years, he invented an easy method of geometrical dialling; which, though he did not publish it‘ till 164-7, was yet received with so much esteem, that Mr. (afterwards sir) Christopher Wren, then a gentleman-commoner of Wadham college, in Oxford, immediately translated it from the English into Latin. This treatise was added to the second edition of his “Clavis,” with this title, “A most easy way for the delineation of plain Sun-dials, only by Geometry,” &c. In 1599 he commenced M. A. having regularly taken his bachelor’s degree three years before. In 1600 he, projected an horizontal instrument for delineating dials upon any kind of plane, and for working most questions which could be performed by the, globe. It was contrived for his private use only, and though not executed so perfectly as if he had had access to better tools, yet he had such an opinion of it, that thirty years afterwards, he consented it should be made public; and it was accordingly published, together with his “Circles of Proportion,” in 1633, 4to, by William Forster, who had been taught the mathematics by Oughtred, but was then himself a teacher of that science. To some editions of this work is subjoined " The just apology of William Oughtred against the slanderous insinuations of Richard Delamain, in a pamphlet called * Grammelogia, or the Mathematical Ring,’ in which the author claimed Oughtred’s invention. 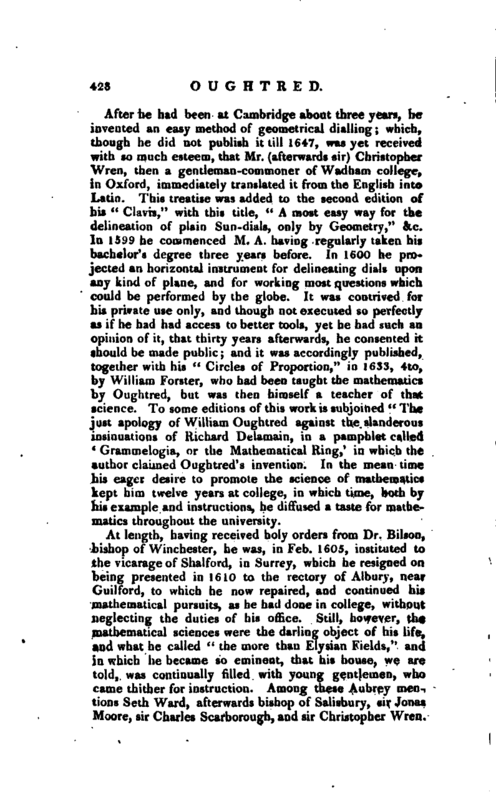 In the mean time his eager desire to promote the science of mathematics kept him twelve years at college, in which time, both by his example and instructions, he diffused a taste for mathematics throughout the university. At length, having received holy orders from Dr. Bilson, bishop of Winchester, he was, in Feb. 1605, instituted to the vicarage of Shalford, in Surrey, which he resigned on being presented in 1610 to the rectory of Albury, near Guilford, to which he now repaired, and continued his mathematical pursuits, as he had done in college, without neglecting the duties of his office. Still, however, the mathematical sciences were the darling object of his life, and what he called “the more than Elysian Fields,” and in which he became so eminent, that his house, we are told, was continually filled with ydtmg gentlemen, who came thither for instruction. Among these Aubrey mentions Seth Ward, afterwards bishop of Salisbury, sir Jonas Moore, sir Charles Scarborough, and sir Christopher Wren. | He taught them all gratis, and although Mr. Ward remained half a year in his house, he would accept of no remuneration for his board. 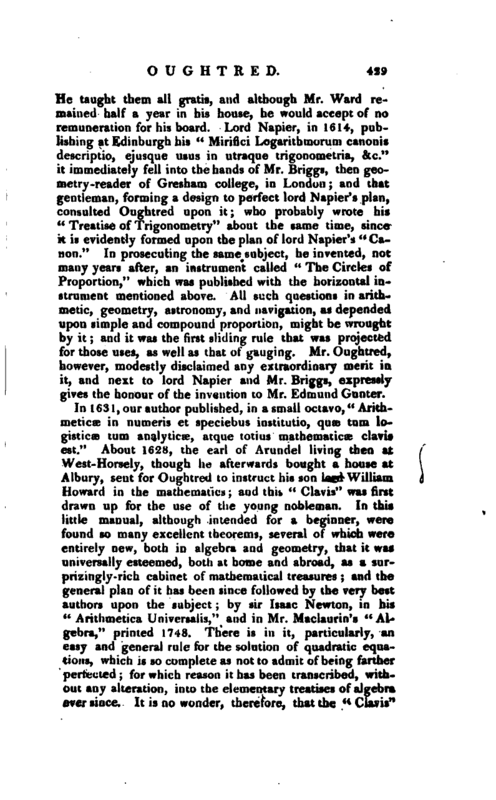 Lord Napier, in 1614, publishing at Edinburgh his “Mirifici Logarithmorum canonis descriptio, ejusqtie usus in utraque trigonometria, &c.” it immediately fell into the hands of Mr. Briggs, then geometry-reader of Gresham college, in London; and that gentleman, forming a design to perfect lord Napier’s plan, consulted Oughtred upon it who probably wrote his “Treatise of Trigonometry” about the same time, since it is evidently formed upon the plan of lord Napier’s “Canon.” In prosecuting the same subject, he invented, not many years after, an instrument called “The Circles of Proportion,” which was published with the horizontal instrument mentioned above. All such questions in arithmetic, geometry, astronomy, and navigation, as depended upon simple and compound proportion, might be wrought by it; and it was the first sliding rule that was projected for those uses, as well as that of gauging. Mr. Oughtred, however, modestly disclaimed any extraordinary merit in it, and next to lord Napier and Mr. Briggs, expressly gives the honour of the invention to Mr. Edmund Gunter. In 1631, our author published, in a small octavo, “Arithmetics in numeris et speciebus institutio, quae turn logisticae turn analytics, atque totius mathematics clavis est.” About 1628, the earl of Arundel living then at West-Horsely, though he afterwards bought a house at Albury, sent for Oughtred to instruct his son lord William Howard in the mathematics; and this “Clavis” was first drawn up for the use of the young nobleman. 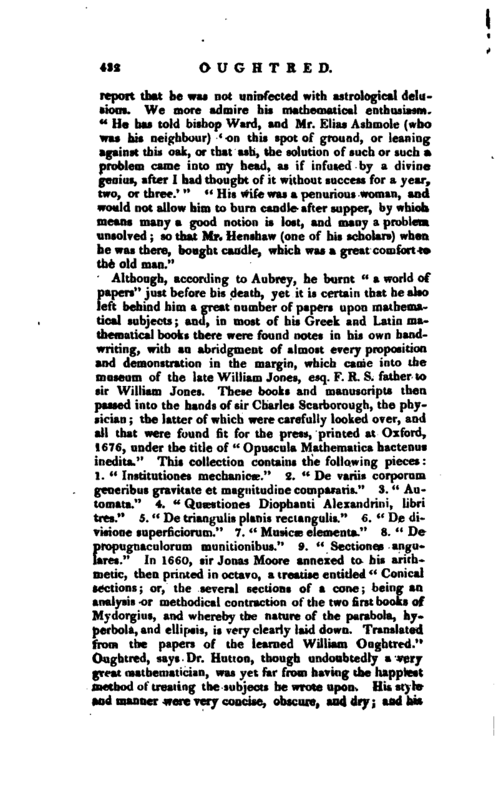 In this little manual, although intended for a beginner, were found so many excellent theorems, several of which were entirely new, both in algebra and geometry, that it was universally esteemed, both at home and abroad, as a surprizingly-rich cabinet of mathematical treasures; and the general plan of it has been since followed by the very best authors upon the subject by sir Isaac Newton, in his “Arithmetica Universalis,” and in Mr. Maclaurin’s “Algebra,” printed 1748. There is in it, particularly, an. easy and general rule for the solution of quadratic equations, which is so complete as not to admit of being farther perfected; for which reason it has been transcribed, without any alteration, into the elementary treatises of algebra ever since, It is no wonder, therefore, that the “Clavis” | became the standard -book with tutors for instructing their pupils in the universities, especially at Cambridge, where it was first introduced by Seth Ward, afterwards bishop of Salisbury. It underwent several editions, to which the author subjoined other things. Notwithstanding all Oughtred’s mathematical merit, he was, in 1646, in danger of a sequestration by the committee for plundering ministers; in order to which, several articles were deposed and sworn against him; but, upon his day of hearing, William Lilly, the famous astrologer, applied to sir Bulstrode Whitelocke and all his old friends, who appeared so numerous in his behalf, that though the chairman and many other presbyterian members were active against him, yet he was cleared by the majority. This Lilly tells us himself, in the “History of his own Life,” where he styles Oughtred the most famous mathematician then of Europe. 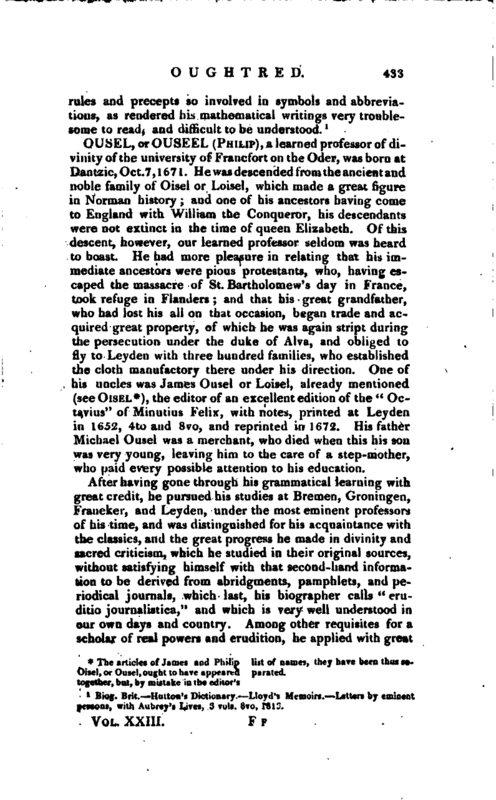 “The truth is,” continues this writer, “he had a considerable parsonage and that alone was enough to sequester any moderate judgment besides, he was also well known to affect his majesty.” His merit, however, appeared so much neglected, and his situation was made so uneasy at home, that his friends procured several invitations to him from abroad, to live either in Italy, France, or Holland, but he chose to encounter all his difficulties at Albury. Aubrey informs us that the grand duke invited him to Florence, and offered him 500l. a year, but he would not accept it because of his religion. From the same author we learn that he was thought a very indifferent preacher, so bent were his thoughts on mathematics; but, when he found himself in danger of being sequestered for a royalist, " he fell to the study of divinity, and preached (they sayd) admirably well, even in his old age. whom he had nine sons (most lived to be men) and four daughters. None of his sons he could make any great scholars. He was a little man, had black hair and black eyes, with a great deal of spirit. His witt was always working. His eldest son Benjamin told me that his father did use to lye a bed till eleven or twelve o‘clock, with his doublet on, ever since he can remember. Studied late at night; went not to bed till 11 o’clock; had his tinder-box by him; and on the top of his bed-staffe he had his inkhorn fixt. He slept but little. Sometimes he went not to bed in two or three nights, and would not come down to meals till he had found out the qu&situm. The articles of James and Philip Oisel, or Ousel, ought to have appeared together, but, by mistake in the editor’s list of names, they have been thus separated.